Some years ago I started to sail on Slalom boards and Camber induced sails. 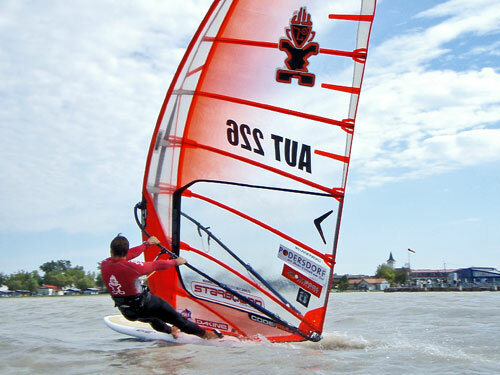 I can remember one day planning in the lightest wind wird a big Carve and a 10 m sail in Pattaya. It was fun and the gear gave me the oppurtunity to play around in lightest conditions. Nowadays I sail many days on big gear. My 9,0 and the 75 cm wide Isonic makes many days to great windsurfing days. Imagine I would have a 100,5 cm wide board with a 70 cm long fin and a 11 m big sail!! Just a day ago the 2008 Formula windsurfing worldchampionships ended. More than 80 men and 15 ladies startet. ItÂ´s a extremely big class. In the overall ranking are mor than 580 men placed. Additionaly I have to write that the gear starts to work in relly less wind, when you sail alone or with some friends. In a big fleet you need a bit more wind. Already slalomgear starts to plan quite early nowadays. With my 9,0 and 122 I can plan in less than 10 knots. But sailing on a 100,5 cm wide board and a 11m sail secures racing in 6 knots already. Besides the action looks exciting, because the boards can really speed up. 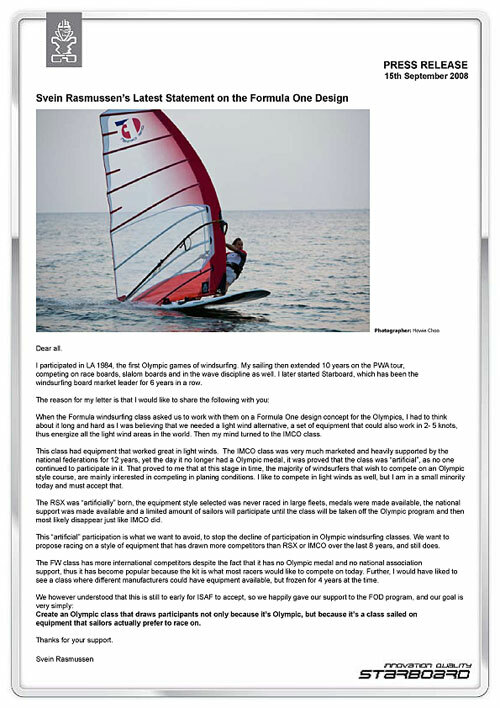 In my opinion the Olympic windsurfing disciplin needs gear, which attracts normal windsurfers as well and especially young people, who will train on this stuff to win National or International events, the Worldtitle or the Olympic Gold medal. And one more point out of my view, why Olympic windsurfing needs a chance: the sport itself is the fastest in between the sailing disciplines. Antoine has the speedrecord, the second fastest is Finian, who is also a windsurfer. On the current gear windsurfing is one of the slowest disciplines. With a Formula board the situation would be changed within a second. LetÂ´s hope that the new concept will find many supporters! Check out the wind sock at the beach. ItÂ´s not up, but my speed is fine having just a 44 cm long fin inside the tuttle box. Now Svein Rasmussen came up with a set of gear, called Formula One Design, which is super easy: one board, one rigg, one fin for a fair price. The whole set works in a wide range of conditions and wind. Svein Rasmussen sailing on the Formula One Design (FOD).